The rain has been pretty much constant here all week. The weeds are growing like crazy, but it's far too wet outside to do anything about it. It's raining so hard right now that the sidewalks are like lakes; I went to the end of the block to buy milk at the corner store, and even with an umbrella my legs were soaked through by the time I got home. Needless to say, I've been staying indoors as much as possible. Tomorrow the canine handlers are having a holiday party. My plan was to bring stollen, but since I don't like citron and a coworker is allergic to almonds, that cuts out the two most significant ingredients. I decided to use some of the fruit from my garden in it instead. 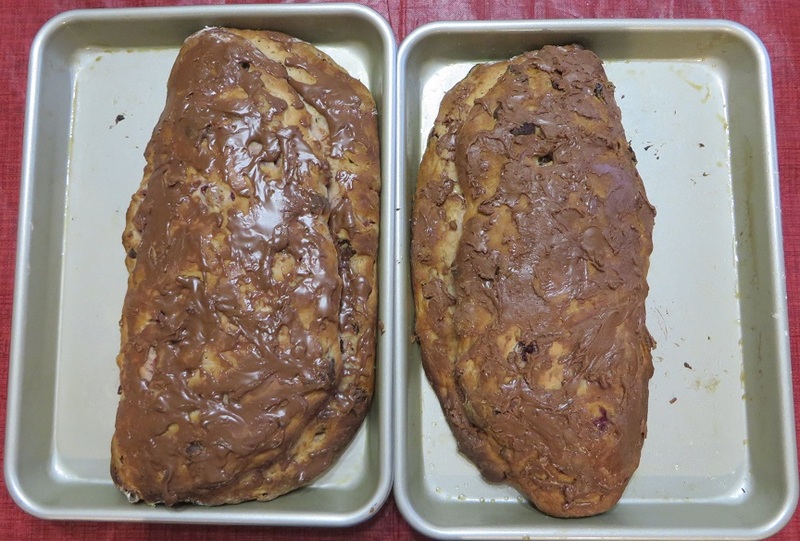 I modified the recipe to make it "black forest" stollen by mixing in a pint of sour cherries and a cup of chocolate chips, then mixing a little cocoa powder into the sugar glaze. The main lesson I learned was to start the yeast separately in water before adding the cherry juice; trying to start the yeast directly in the juice just didn't work. Also, I think I could have used fewer chocolate chips, because the chocolate was a bit overpowering, but that's a matter of personal taste. In other news, I see that Disney is producing a movie version of Into the Woods. I may actually have to go to the theater to watch that. ...and my cunning plan to dump the wild sweet orange Tazo tea I didn't like on you comes to naught. You're welcome to bring it over if you like. Jenn often drinks tea when she visits, and she might enjoy it. I hate to say anything about the rain because we need it so desperately. Unfortunately, I also hate to be rained on. Agreed. I had to cancel attending a game meetup on Tuesday because it was raining so hard. No fun. I can hardly wait to try the recipe! It sounds like a winner to me. They look beautiful. One thing I should mention is that I cooked the sugar in with the cherries for a few minutes. That helped a lot of the juice come out of the cherries so that it could be used as liquid for the dough. The rest of the procedure was as normal. That sounds like a good idea. Then the cherry flavor would be throughout the stollen, not just in the cherries.